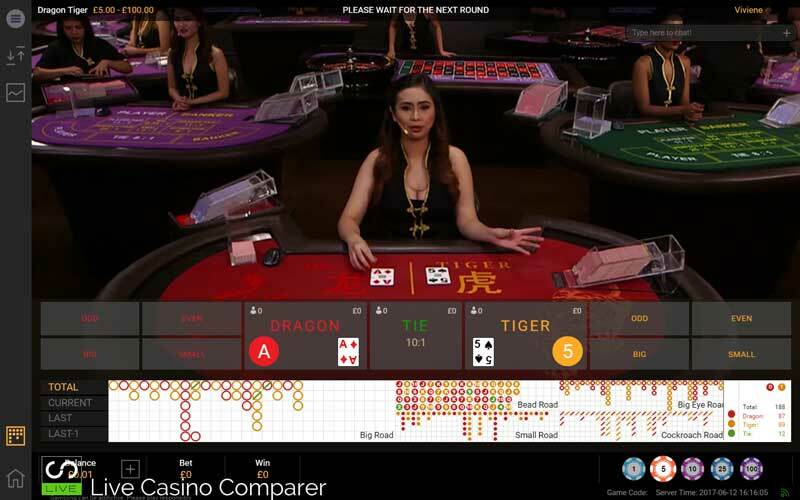 Dragon Tiger is a variant of Baccarat and is probably one of the simplest casino games to play at a live casino. Two cards are dealt, one to the Dragon and one to the Tiger position. You bet on whether the Dragon or Tiger card will be higher. As with all live casino games there is a choice of where you can play. There’s also a choice of software providers, with each having some aspect of their game that’s different from the others. These variations include the Payout structures and the Side Bets on offer. Licensing also becomes a factor, with some countries having restrictions placed on them on where their players can play. Forearmed is forewarned, so I’ve done by best to highlight all the differences, making it easier for you to make a decision on where to play. Live Dragon Tiger is normally played with 8 decks and these are shuffled when only one deck is remaining, although this can be different between software providers. An Ace is counted as low. A King is counted as 13, Queen 12 etc etc. Before any cards are dealt the player can place the following bets, but this will be dependent on the game supplier providing them (not all do!). Dragon or Tiger – which will have the higher card. A Tie – whether the cards will be the same value. Dragon or Tiger Big – whether the card will be above 7. If it’s a seven the player loses the bet. Dragon or Tiger Small – whether the card will be below 7. If it’s a seven the player loses the bet. Dragon or Tiger Suit – Whether the card will be Heart/Diamond/Spade or Club. If the card is a seven the player loses the bet. If you have bet on Dragon / Tiger and the result is a tie 50% of your bet is returned to you. The remaining is taken as commission. 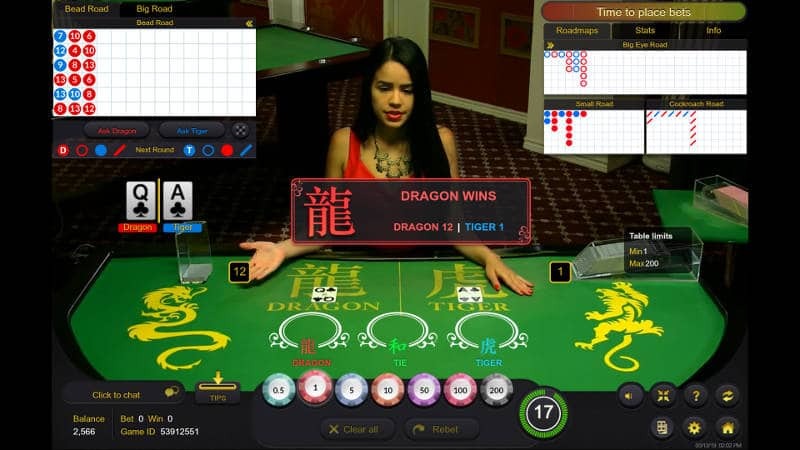 Dragon Tiger is offered by Evolution Gaming, Playtech, Ezugi & Xpro Gaming. Lets take a quick look at each. Evolution probably has the most visually pleasing User Interface of all of the software providers. Ties are paid at 11:1, while a suited Tie pays 50:1. There’s a nice set of roadmaps which depict the previous results from the shoe. Playtech has a darker looking player interface than some of it’s rivals. The game is streamed from the Manila studio in the Philippines. The dealers speak English and you always get a warm welcome when joining the table. The Playtech version comes with the most side bets of any supplier, buts has a slightly worse payout for Ties than Evolution Gaming at 10:1. A rather more traditional looking playing interface for Ezugi Dragon Tiger. The table is located in Ezugi’s studios in Costa Rica. The game itself is played with an 8 deck shoe. Roadmaps track the history of the shoe. You can choose whether to display them or not. Tie’s pay a measly 8:1 at the Ezugi table and there’s no additional side bets. This is a good choice if you like a traditional game, but bad if you you like to play the Tie bet. XPG has the most comprehensive version of the game. As well as normal side bets of Big/Small, Odd/Even, there’s a range where you can predict the suit of the winning card. These pay 3:1 rather than even money you’d get on the other side bets. The eagle eyed of you will notice that it’s 3 -1 rather than 4-1. That’s where the edge for the house comes in. XPG Dragon Tiger is not available to UK players due to licensing restrictions. 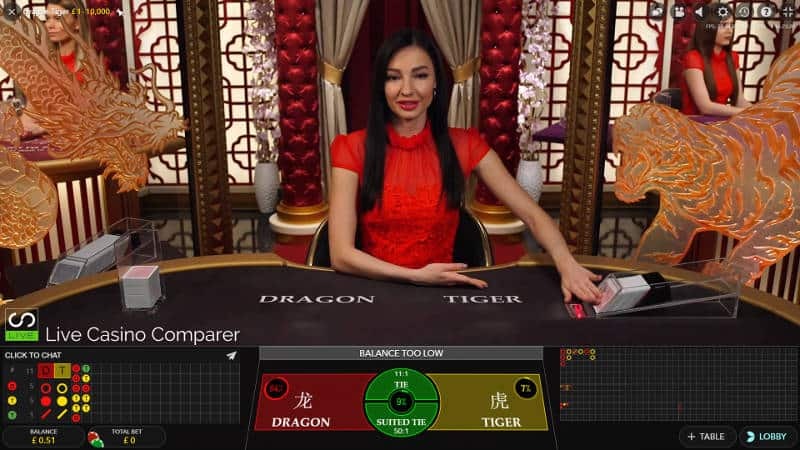 Dragon Tiger is available at 4 Live Casino Providers (if you exclude the Asian providers like Asia Tech Live). For European players both Playtech, Evolution, Ezugi and XPG has versions, so here’s a quick rundown of the differences between them. If you want a good selection of Side Bets then pick one of the Playtech Casinos or XPG Casinos to play at. Their games have more side bets than anyone else. The suited side bet is only available at XPG casinos. The Evolution version pays Ties at 11:1, while at Playtech you get 10:1 and XPG & Ezugi you’ll only see 8:1. If you like a slick modern looking environment then head to an Evolution Casino. The Playtech one is a bit dark. All versions come with Roadmaps. In my opinion the ones from Evolution are easier to read. Game rounds are quick wherever you play. It’s one of the easiest games to get your head around. You can’t go wrong if you play at Evolution or Playtech Casinos. Unfortunately XPG Casinos are more difficult to find, while Ezugi Casinos should be avoided if you play the Tie Bets.